Plot: Without giving anything away, the film is about the serial killer known as the Zodiac, who terrorized Northern California in the 1960s and 1970s. The film focuses not only on the killer, but on the people who are investigating him, including the police and writers from the San Francisco Chronicle. Why you should watch it: Released in 2007, this film holds an 89% rating on Rotten Tomatoes. People either love this film or they hate it. Fincher, the director, is a bit of a polarizing filmmaker. His previous film, Panic Room, was panned for being underwhelming at best. 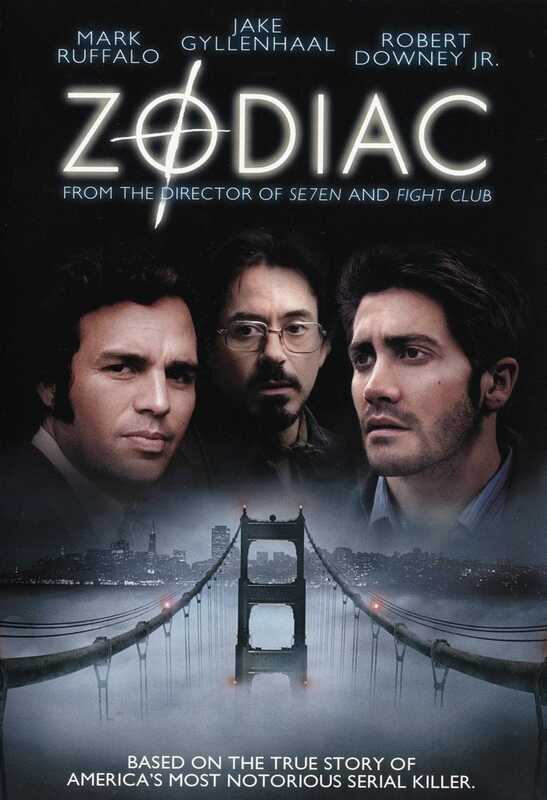 Zodiac sought to be his bounce-back film. To some degree, it was. The cast is very well rounded. Robert Downey Jr as the alcoholic journalist Paul Avery is a perfect fit. He blends a world weariness with alcohol/drug dependency combined with a journalistic determination to create a character that is magnetic. Jake Gyllenhaal as the political cartoonist Robert Graysmith is a bundle of nervous energy. He, too, is driven to discover the identity of the Zodiac killer. I also loved Mark Ruffalo as Inspector Dave Toschi, a San Francisco detective hunting down every confusing lead and chasing what amounts to a ghost. The subject matter is tremendous as well. The film is based on Graysmith’s true-crime novel of the same name. It remains to this day one of the most frightening books I have ever read. I have personally bought about six different copies over the years, because I keep loaning them out and never get them back. The idea of a serial killer who taunts the police with letters and clues only he would know is unsettling. The Zodiac claimed 37 victims, however only seven were ever confirmed, two of whom survived. Zodiac penned letters to the police and the newspapers from 1969 to 1974. These dared the police, and anyone else, to surmise his identity; nobody was able to. A curious little side note - there are three people in this film who would have an impact on the Marvel cinematic universe. RDJ is, of course, Iron Man. Mark Ruffalo is the Hulk. Finally, Brian Cox (who plays celebrity lawyer Melvin Belli) is Colonel Stryker, the man who created Weapon X - Wolverine. Donal Logue has a connection via Ghost Rider, but nobody saw that tremendous turd of a movie, so it doesn’t count. You should give the trailer a look. It actually does the film justice, to a degree. It’s on Netflix. Let me know what you think in the comments.